The royal dad-to-be proved yet again that he’s a natural when it comes to connecting with kids. Ballet, a baby and Prince Harry: Could there be any cuter combination? The Duke of Sussex, who is preparing to become a dad in the coming weeks, stopped by the YMCA South Ealing in London on Wednesday to learn more about the organization’s work on mental health and homelessness. Of course, wherever Harry goes, he seems to bring the fun. Harry dropped in on a ballet class for 4- to 6-year-olds at the community center, where he chatted with the young ballerinas and practiced doing pirouettes with the group. 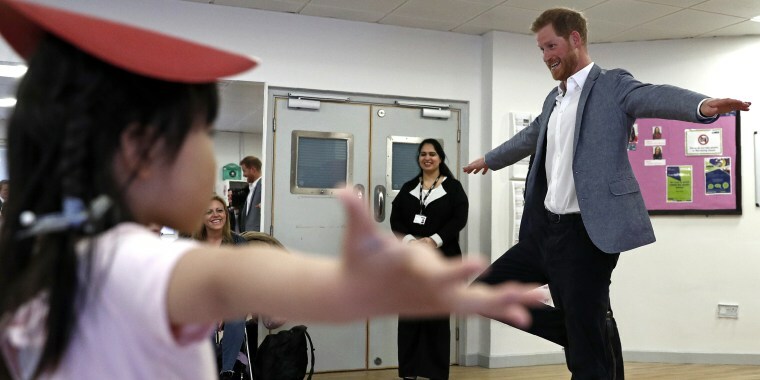 While he stopped short of wearing ballerina slippers and a tutu, Harry was a great sport and a natural with the kids, who seemed to be all smiles in the prince’s presence. The soon-to-be dad couldn't help but notice one particularly cute member of the audience: 3-month-old Naz, who was watching the group of young ballerinas with her mother. The smiling prince crouched down, getting on eye level with the baby girl. As he said a few words to Naz, he got an adorable smile and laugh from the infant! As if that moment wasn’t enough to gush about, Harry gave Naz a little tickle before continuing on with his visit. Harry’s big day out comes just a day after he and Meghan, Duchess of Sussex, finally joined Instagram. The @sussexroyal account posted for the second time on Wednesday, highlighting the prince's visit to the YMCA. We just hope they post plenty of photos of their upcoming new arrival, because there’s no doubt that Harry and Meghan are going to be very fun parents!